Year 2010 is coming to an end soon at this part of the world. There are many ups and many downs too for me this year and I am so glad it will be over soon. I hope year 2011 will be better for all of us. Here wishing my family, friends and all my blog readers Good Health, Joy and Peace for the year 2011. Happy New Year Everyone!!! Diana gave me a big bag of Korean pancake mix and it had been sitting in my pantry for a while now. I finally decided to try my hand in making Korean pancakes/Pa jeon. This pancake is very simple to make. All you have to do is mix the flour with some water; add in your favorite veggies like carrots, green onions, cabbage, mushrooms and any kind of seafood of your choice. You can omit the seafood for a vegetarian version. There is abundance of fresh cranberries in the market now and I just bought a big packet without knowing what to do with it. It has been sitting in the fridge for nearly two weeks until I finally used it to bake some cakes to be given away as Christmas gift with the cookies. The orange juice and the zest in the cake compliment the cranberries very nicely. The fresh cranberries are tart and refreshing, while the cake is sweet. This loaf will be great for breakfast, afternoon tea especially during the holiday season. I baked these sugar cookies at the very last minutes for my nephew Eu-Xin in Malaysia. My friend is going back end of this month and she is taking these back for me. Thank you so much Choy and I am sure my nephew will be very grateful. I am not good at frosting it and in fact this is the first time I am doing sugar cookies. I hope I will do a better job the next time when I have more time to decorate it. Weather is so cold and snowing outside and the best way to warm up the house is doing some baking. But it is definitely not a good idea to make bread. Wrong move on my part and because of the cold making this loaf of bread took me over 6 hours from start to finished baking. It just refused to rise. I even stick it into the warm oven to help with the proofing. The end results, I would prefer it to rise a bit more and softer. Nevertheless, it tasted good. I think this tea ring will be great for Christmas breakfast or brunch. Dough recipe adapted from Taste Of Home recipe book. I always wanted to make this Chinese Baba Nyonya wedding specialty cakes. It is called Pulut Tai Tai or Blue Glutinous Rice Cakes. The blue stain comes from a flower name Bunga Telang or Blue Pea Flower. Since I still have some of the dried blue pea flowers given by Sonia I decided to made some when my friend Choy’s and her family came to our house for dinner not too long ago Traditionally, this cakes are served with kaya (coconut egg jam) and you can find the recipe here. 12 - 15 blue pea flowers – soak in some warm water,crush it to extract the blue coloring. It has been a long busy week for me. I have been baking non-stop for the past 5 days. There were dozens and dozens of cookies being baked and tons of butter, sugar, flour and eggs used. I am so glad that I am finally done with it and it is going to some happy recipients before Christmas. The cookies I baked are mostly repeats like Walnut Cookies/Hup Toh Sow, Macadamia Chocolate Chips, Festive Meringue Kisses and this Coconut Cookies. Do come back for the Macadamia Chocoloate Chips cookies recipe later. Our neighbor Nancy gave us some lobsters last week. I decided to make some lobster rolls out of it. This classic New England lobster rolls, a basic hot dog bun filled with lobster salad. There are no fancy seasonings here; the lobster is showcased of this rolls. It is just a simple mayonnaise dressing with a bit of lemon juice and season with salt and pepper. If there is a choice between French fries or sweet potato fries I will definitely pick the latter. But not many restaurants serve this so I will normally make it myself. I baked this instead of frying it so it's much healthier. The baked sweet potato wedges might not be as crispy as the fried one but they tasted just as good. They are slightly crispy on the outside and sweet and soft on the inside. I like serving this with a mix of mayo and ketchup. Each year we have problem finishing up our 12 pound Thanksgiving turkey. Actually that was the smallest bird I could find from the supermarket. The 3 of us only managed to finish one side of the breast and I have to think of ways to finish them up. I already made some rice porridge with one of the turkey leg and wing, turkey pot pie with the meat, sandwiches with the breast meat and turkey stock from the carcass. This is one of the soups I made from the stock and the leftover meat. I always have a soft spot for chicken or beef Rendang. That is the very first Malay dish I learned to cook from my friend Kak Zuliah mom’s many years ago. Now there are so many ready packed rendang paste but I still prefer to cook it from scratch as most of the ingredients are readily available here. I even plant my own kaffir lime and turmeric plants now. Turmeric can’t survive the winter so I cut all the leaves up and freeze it so that I can use it whenever I want. The ingredients are pretty similar to my beef rendang; the only difference would be the cooking time as the chicken get tender pretty fast compare to beef. I’ve posted this before but it is a different recipe. I did some changes to the recipe and also tinted the glutinous with some bunga telang(butterfly pea or clitorea ternated) given to me by Sonia when I went back to Malaysia early this year. This flower which was used to blue the rice in nasi kerabu (rice salad) or nyonya kueh but now many of them just used the blue coloring. To obtain the color from the bunga telang, the blooms are dried in the sun before storing. When required, they are soaked in water to allow the color to seep out and subsequently, obtain the rich blue color. My friend Sue given me some seeds and I planted it during summer. I think I planted it a bit too late and by the time it started to flower it was already late summer so I didn’t get much flowers out of it. I kept quite a bit of seeds for my next season planting. No sure why but the plants have more leaves than flowers. I made these sometime ago when corns were at their peak during summer. I will usually grill or boil it but this time I made some fritters out of it. I used a bit of oil to pan fried them in a non stick pan and it turn out more like a pancakes. The fritters were crispy on the edges and tender in the middle. We had this with my homemade chili sauce. Now what is this exotic Prickly Pear?? 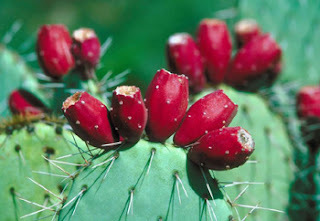 They are known to few, the fruit of the nopales cactus (cacti with beaver tail-like paddles), are actually edible. Called prickly pears, these vibrant magenta color fruits are delicious,they taste like a cross between watermelon and pear. The best way to eat this is just cut it into halve and use a spoon to scoop out the flesh. The juice is often used to make jam or candy, but works wonders in cocktails and used in vinaigrettes for salads. I've seen people used the juice to flavor cream cheese frosting for cakes and have seen others boil it down with a bit of orange and lemon juice to make a sauce for fruit salads and cheesecakes. We used to have one huge cactus plant at my mom house and there were plenty of these fruits on it but during that time we have no clue that they are edible. So the birds had a field time eating the sweet fruits. Yes, we have a winner. The person who guessed the flavor correctly is Wendy of Table for 2 or More. The Chiffon Cake is made out of Prickly Pears. The recipe and details of the fruits will be coming up next. Thank you everyone for taking the time to participate. There are some very good guesses and I will be making some of the flavor that you suggested. Do come back and check out another one of my giveaway soon. Wendy, these gifts will be coming your way soon. 3. 1 year 2011 and 2012 planner - cupcakes photographs by Kylie Lambert. Can anyone guess what the flavor of this chiffon cake is? The first correct answer will receive some gifts from me. Oh, in case you are wondering, this is open to anyone anywhere in the world and not just for USA readers. Remember to leave your email address in your comment. Dateline for this guessing game will be on the 24th November 2010 at 11.00am (Eastern Time) Good Luck. This braid is very similar to my Blueberry Cream Cheese Loaf but this time I made the dough from scratch rather than using the store bought kind. I mix the dough and let it rise overnight and in the morning I just shape it up and we have freshly bake bread for our breakfast or brunch. It might takes some time to prepare this bread but the results are worth the extra effort. These are one finger licking ribs. The meat is so tender and juicy that it falls off the bones easily. The sauce is sweet, tangy and with a light hint of 5 spice powder. The secret of cooking this tender ribs is wrap it up in foil and let it cook long and slow in the oven. Normally we will grill it on the BBQ after the baking part but since we already clean up BBQ set so I did it all in the oven. The results are just as good except minus for the smoky flavor. Marcus of Ile De France sent me a sample of Camembert to try out. This mild soft and creamy cheese which has a wonderful aromatic mushrooms and nutty undertones is crafted in Normandy from local RBST free pasteurized cow milk. The herds spend most of their time outside, grazing in the fields of Normandy; known for its temperate climate and rich soil. I made these wonderful tarts with the mushroom and tomato and pair it with the camembert. The combination of flavors is just great and this one is a real winner. Why not try this out for your coming Thanksgiving gathering or Christmas party. I am pretty sure it will be a crowd pleaser. Ipoh is famous of their hor fun (flat rice noodles). The star of this noodle dish is the silky-smooth flat noodles, or as the locals calls it, hor fun. Around Ipoh, vendors may serve the hor fun in a clear chicken broth, or with chicken-and-shrimp broth. I actually cooked this noodles many months and only post it now as I totally forgoteen about it. This is another classic Chinese dish originated from Taiwan. The main ingredients for this dish are using 1 cup soy sauce, one cup of sesame oil, one cup of rice wine and a generous amount of Thai basil leaves. That is how it got its name 3 cups chicken (san bei ji) The first time I tasted this dish was when I went home last year and my BIL CK took me to a famous Taiwanese restaurant called Fong Lye. Once I tasted the dish I fell in love with it. So here is my version of 3 cups chicken but I didn’t use the whole cup of sesame oil and soy sauce. I think that is a bit too much for me but do feel free to adjust the amount of marinate to your liking. This cake is made with dark brown sugar. So far I think this is the first butter cake I made using dark brown sugar and I was pretty satisfied with the outcome. The brown sugar gives the cake a rich, buttery, caramel like flavor, almost like butterscotch. The cake taste even better the next day. When the weather gets cold I get lazy too. There are days I like something simple for my lunch. No elaborate preparation or cooking. I bought a huge bag of okra/lady fingers from the produce place for only $2.00 and beside stir-fry with eggs or put it in curries this is how I like it. Simple and delicious!! Sugar and salt to taste. This is one of the favorite tea time snacks in Malaysia and you can usually find stalls selling them by road side stall in the afternoon or at the night market. This is something so readily available back home and I don’t usually make them. But here in the US when craving strike I have to make it myself. The last time I made this was in 2007 when my sisters came to visit us so it is time to make some for my evening tea and keep some for my mee rebus. When I went to the Latin store I will usually get a few jars of DDL. I used a jar for Carlos birthday cake and there were some leftover from it and decided to used it for Chiffon Cake. This was the first time I bake chiffon cake with it and I love the outcome of it. The cake has a nice fragrant of DDL and not too sweet. Even Carlos who never likes chiffon cake eats it. Do you think I convert him into liking chiffon cake? I don’t think so. If you ask me it is not the chiffon cake he likes but it is more of the DDL I drizzle on top ha ha… For this cake I used the Rainbow Chiffon Cake recipe but with very slight changes. The weather here in PA is telling me it’s time for some Chili. For anyone who is not familiar with the cuisine of the Southwestern United States, this stew-like dish called Chili may be a bit puzzling. Yes, it does usually contain green hot peppers as well as chili powder. The Chili has meat in it and it could be ground beef, pork, chicken, or turkey, but Chili can be a vegetarian dish too. You can replace the ground meat with tofu cubes. There are Chili recipes with or without beans, but if you use beans any type of bean will work, including red beans, black beans, white beans, pinto beans, and more. This is an easy, healthy, hearty and inexpensive meal and everyone will love. It has been a long while since I bake any cookies. The last cookies I baked were Chocolate Chips, Cranberry and Macadamia Nut Cookies and that was in May. I baked this batch this batch of traditional pandan flavor cookies during our Hari Raya celebration and gave some to Zue. I think everyone knows how to make good plate of fried rice. I’ve fried tons of it my life using different type of ingredients and by far I think this is my favorite. My friend Richard told me one day he uses herbs like kaffir lime leaves and curry leaves from his garden to make his fried rice and it turn out really good. What a great idea for a change from our regular fried rice. Inspired by his fried rice this is something I came up with. I hope you try this out as I am sure you are going to like it too. Weather is getting cold and the day is getting shorter. What is it that makes the fall such a beautiful season? Is it the cooler air or the shades of red, yellow, orange and pink coloring the world around you just come to life? And the pumpkins!! Who can miss that? With so many pumpkins all around me I just have to cook something with it. In the cold weather what can be better than a bowl of sweet hearty soup. The different with this soup is that I roasted the pumpkin first. Roasting the pumpkin for the soup encourages the natural sugars to caramelize and enriches its flavor creating a more complex soup. I made this cake for Carlos birthday a few weeks ago. I asked him what cake he likes for his birthday and all he wants is a simple yellow cake with Dulce De Leche Frosting. Carlos (from Argentina) grew up eating DDL with all his dessert so it is his all time favorite. But for me when I heard DDL I already can imagine how sweet the cake will taste which I am not a big fan of, but since it is his birthday I can’t say no to his request. Then I remember seeing Wendy made frosting out of fresh cream and DDL and decided to use that. Baklava is a delicious phyllo pastry popular in Middle Eastern countries. Its supposed origins are Turkish, dating to the Byzantine Empire (or even further), though many cultures claim it for their own. Many Greek and Lebanese restaurants do serve this. Baklava is usually layer with crispy phyllo dough alternate with sugary spiced nut mixture, and the whole thing is then soaked in fragrant sweet syrup made with honey, lemon and cinnamon.